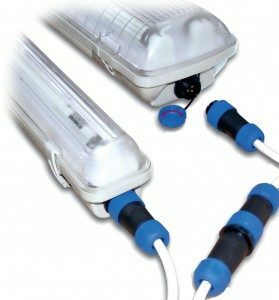 innovative simpleFIX plug and play lighting system. SimpleFIX offers a quick and easy method of installing multiple lighting components – indoors or out – without the need for complex wiring, thus saving the end user time and money. Key to its success is the rugged, waterproof connection system, which enables multiple lighting units to be daisy-chained together, using a single power source. Greenstock called on the expert advice of Live Electronics to recommend a robust, fully-sealed yet cost-effective connector system, and the 21mm diameter Weipu SP21 series proved to be a perfect fit. With its full range of in-line and panel-mount options, the SP21’s threaded coupling, simple construction and IP68-sealing offer all the functionality required for this and many other demanding applications. Available in 2 to 12 pole versions, and rated at up to 30A, the SP21 boasts a UL94V-0 flammability rating. For situations where space is at a premium, 13mm and 17mm diameter ranges are also available. Live Electronics is a specialist supplier of e-mech components and associated products, working with leading manufacturing and trading partners including Cherry, Idec and IMO. It provides the highest levels of technical capability, together with service levels that are second to none. From product specification to special delivery, Live Electronics provides the service that its customers require. See www.liveelectronics.co.uk, or contact Live Electronics on info@liveelectronics.co.uk / 01536 524700.